May | 2015 | "It's Only Nuts & Bolts"
There are two types of buildings which fascinate me more than any others; castles and lighthouses. Both are amazing pieces of engineering developed in different times and for very different reasons, but in some ways similar in their strength, complexity and often incredibly difficult locations. There aren’t too many castles in Australia, well actually none that I am aware of, but there are an abundance of lighthouses and so I had already made it my mission to visit as many as possible, starting first with New South Wales and then further afield as the opportunity arises. No work today and no house issues either. Today was a day to relax and have a break. Today was a day to find a lighthouse! When chatting in the office during my first week the guys had mentioned the prepaid Opal card for getting around on public transport. Same concept as the Oyster card in London, the difference being here you get both discounted, and even free, journeys. Previously my daily commute was costing $8, now with Opal it was less than $7. A result, but better still after you have made a number of journeys, eight I believe, the rest of the week is free and so my trip to IKEA on Friday, Chatswood and Sydney yesterday and Sydney again today havent cost me anything. But not only does this work on the trains, my ferry ride from Circular Quay and back was also free. What a brilliant system. So the lesson here is simply, if you travel to Sydney and are going to use public transport get an Opal card. You would be foolish not to. Having decided today was going to be a lazy one I needed to decide what I was going to do. I certainly didn’t want to sit around the apartment all day as the weather was just too nice and so I headed into Sydney. On the way I had a look at the map and picked a location which included a ferry ride. As I have written previously not only are the trains great, but Sydney Ferries are brilliant too. Many people use them as a way to commute, but for me they are both a way of getting somewhere and a pleasure in their own right. I picked Watsons Bay. A reasonable journey from Circular Quay, it ensured that I would enjoy the boat ride as well as the destination. Once off the boat it was a pleasant and relaxed walk up to South Head and the Hornby Lighthouse. 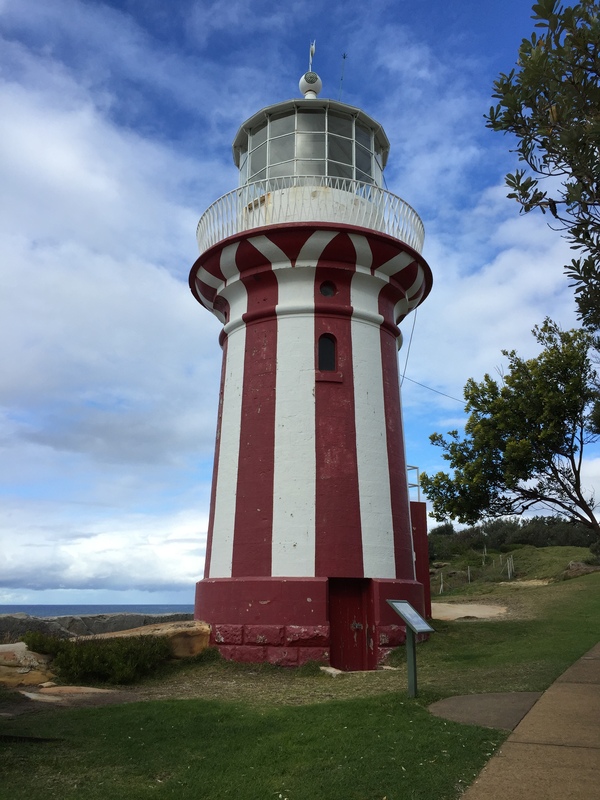 This red and white striped lighthouse was built in 1858 following the tragic loss of over 120 lives when British clipper Dunbar was wrecked during a storm the year before. It’s distinctive colouring was chosen to ensure that it wasn’t mistaken for the Macquarie Lighthouse 2km to the south. As you follow the path to South Head you come across various concrete defensive structures as well as a large gun pointing back towards the city. My immediate assumption was that they must have been constructed during the last war to help protect Sydney from the threat of a Japanese invasion. Although they were used for this purpose, they were actually constructed much earlier, and for a very different purpose. 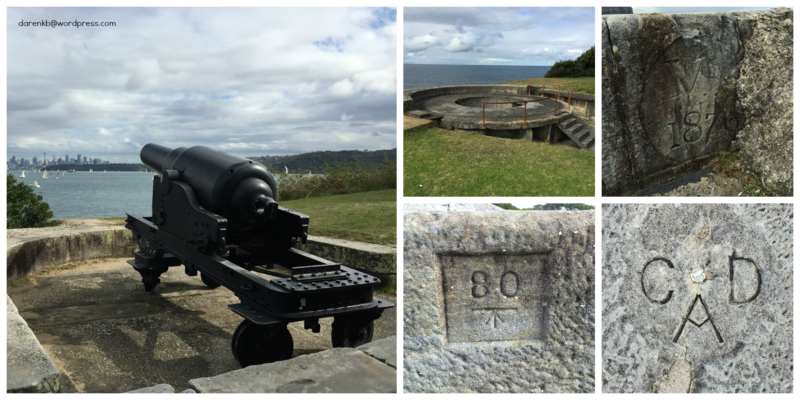 The first gun emplacement at South Head was recorded in 1788 and was used to signal the arrival of a vessel in the harbour. The fortifications that can be seen today were completed in 1854, although the guns weren’t actually in position until 1872. These were constructed to protect against various enemies; initially the French but then the Americans during the war of independence. Later the French were again considered the threat before they become allies against the Russians during the Crimean War. The defences were further enhanced during both world wars, but although manned constantly the lookouts failed to spot the three Japanese midget submarines which managed to enter the harbour on 31st May 1942 attaching a number of ships, sinking the converted ferry HMAS Kuttabul which resulted in the deaths of 21 sailors. Just by the lighthouse are the keepers cottages. 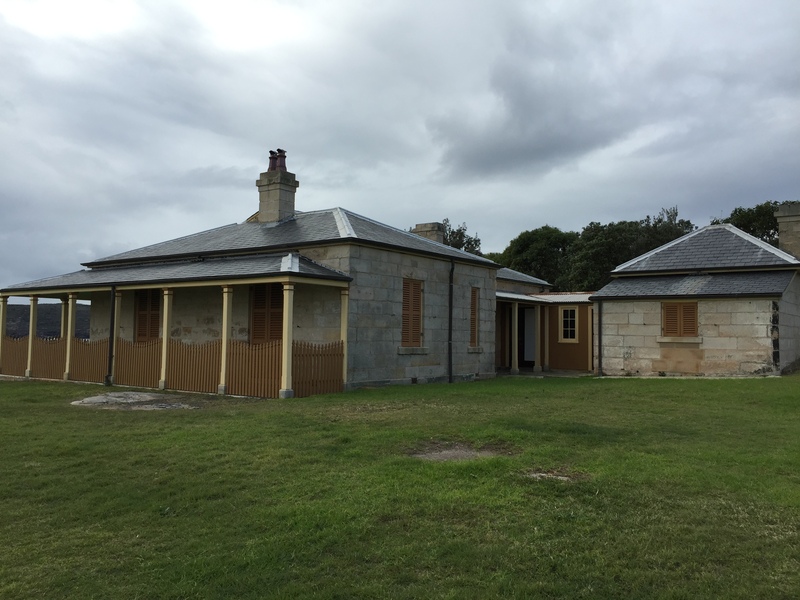 Now fully restored these houses must have some of the best views of the harbour and city, as well as enjoying a relatively quiet location. Returning back to Watsons Bay it was time to sit, write and generally enjoy the beautiful autumn weather. With several coffees and a bag of chips, I sat for a good few hours and simply enjoy watching the world go by. A really wonderful Sunday afternoon. A New Year, A New Life …. I have been back in Sydney for nearly 2 weeks and only now feel able to write my first post of 2015. What made be knuckle down? Simple, a walk round Sydney was all that was needed to remind me why I had made the decisions I had ….. Earlier in the year I was approached to see if I would like to move to Australia on a permanent basis. With my marriage over and house already up for sale due to the divorce, it felt like I only had one reason to say no and that was Lauren. We had many long conversations about the the pros and cons of such a move. I had many sleepless nights as I thought about the enormity of what I was considering, but in the end it was just too good an opportunity to miss. Never before had I received such an offer, and at my age it is unlikely that I would get such an offer again. After a number of discussions with my old employer about a leaving date, in theory I needed to give three months notice, and receipt of formal jobs offers and contracts of employment from my new employer, the decision was made and the wheels of my new life started to roll. On Friday 27th February 2015 I left Causeway with just a week and a half’s notice after being employed by them for over 16 years. On the following Monday I started in Woking for my new employer Mouchel. An agreement was put in place that I would be employed by the UK business while my visa application was processed and then switch to the Australian company as soon as I was able to move to Sydney. During that interim two months I continued to spend time in Manchester working with the team there, with whom I had a brilliant night out aft my last day working with them. Tuesday 5th May saw my arrival in Sydney on a one way ticket. Mouchel engage a relocation manager to help new arrivals find both temporary and permanent accommodation as well as anything else you need when setting up home in a new country. Without doubt I felt much more relaxed about the process than many would having already spent four months here last year and therefore knowing my way around; a little. Melissa collected me from the airport, which was brilliant, and made sure I was settled in my apartment in St. Leonards. After a sleep I headed to the office in North Ryde to meet the new team and then down to Lane Cove to say “hi” to everyone I had met last year – and what a seriously brilliant welcome I got at Lane Cove! It certainly felt good to be back amongst friends. It turned out that many of the team in North Ryde, the new Mouchel Design Centre for Australia, had only been there a short time before me. In fact they had only moved into the office the Friday before I arrived and so it was decided that a night out was in order for people to get to know one another. On my first Thursday back in the county we headed to the Glenmore Hotel in The Rocks district of Sydney for a few drinks and something to eat. I had been to the Glenmore before and would highly recommend it if only for the amazing views over the harbour and Opera House from the roof terrace. Saturday was to be spent house hunting! Well more specifically apartment hunting. Melissa picked me up at 09:30 and we were off on a whistle stop tour of Lane Cove, Chatswood and the surrounding communities. Rightly or wrongly I had decided that I didn’t want to be too far from the office or, if possible a train station. This meant that my already tight budget was going to be stretched to its limit. They have a very strange system in Australia for rental accommodation, and possibly purchases as well. You don’t make an appointment to view, the agent simply advertises when he will be at a property and all are welcome to view. The “open house” time slots are often as little as 10 or 15 minutes!! 10 minutes in which to view and make up your mind on somewhere you could be living for the next year or more. At one apartment there must have been 30 people queuing up and making their way through a two bedroom property! Having viewed about 10 places they were beginning to merge one into another, but what was clear to me was that the majority where simply not suitable. The last however would suit me just fine. Although a little older than I perhaps would have liked, the layout was perfect, the street lovely and the whole place had been recently decorated through out. Having thought about it on Sunday, and also looked on line at a number of other properties and locations, I decided that Stokes Street would do me just fine. My application was put together on Monday, various documents copied and sent through to the letting agents on Tuesday and lots of telephone calls by Melissa to see what was going on. It seemed there were three of us interested and it was up to the landlord to decide who they liked best. Finally midday Wednesday I go the news that the property was mine! By all accounts I was incredibly lucky to get the first place I chose as most people it seems have to go through this process a number of times before they are accepted. The property market in Sydney is certainly very fast moving at the moment. All the papers were signed last Friday and I move in next Friday! On Thursday night I went out for dinner and a few drinks with some of the guys from the Lane Cove office as a welcome back celebration. We went to the Longueville Hotel in Lane Cove which was not only where we went for lunch on the last day before I left at Christmas, but will soon be my local! Another great night; I am looking forward to many more! Having signed all the paperwork I now need to concentrate on getting furniture and everything else that is needed to make a property a home. Friday evening I went to IKEA and made a list of those items I needed first off. Back at my apartment the list was extended to cover all those items you can’t buy at IKEA – not too many additions to be honest – and then finally a few decisions about the logistics of it all. Saturday I went into Chatswood to check out a few more bits and also picked up my first purchases; kettle, toaster and iron. After shopping I decided I needed a break and so header to Sydney proper for the first time this visit. My first couple of weeks had been busy doing many of the routine things of life with little time to relax or enjoy my new surroundings. But finally I was in the city wandering through the streets, the botanical gardens and round the Opera House and Circular Quay. Now I remembered exactly why I had mad the crazy decision to move half way round the world and start a whole new life.